Vertebral compression fractures can occur because of trauma from a fall, a forceful jump, or a car accident or a tumour that spreads to the spine from elsewhere. Vertebral compression fractures usually are caused by osteoporosis, a condition that causes a thinning of the bone. The thinning bones can cause tiny fractures during normal activities. In severe cases of osteoporosis, a simple movement like bending forward can cause spinal compression fracture resulting in kyphosis, a hump-like curvature of the spine. The most common symptom of vertebral compression fracture is severe pain in your back, which worsens on standing or walking and decreases when resting. You may also feel weakness and numbness in the affected areas, disability, and limited spinal mobility. You may also often notice a loss of overall height. Patients who sustain multiple compression fractures may have hunched back (kyphosis), gastrointestinal problems, hip pain, and shortness of breath. MRI Scan: A MRI of the spine may be performed to know if the fracture is old or new and to detect other soft tissue abnormalities. 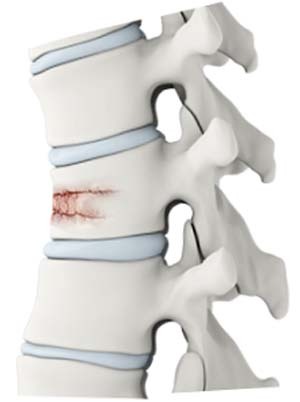 The treatment for vertebral compression fractures aims at reducing the pain and stabilising and repairing the fracture. This is best achieved by medications, back braces, bed rest, and physical therapy. Vertebroplasty: This technique involves inserting a cement material called polymethylmethacrylate, into the bone of the collapsed vertebra with the needle and syringe under the guidance of X-ray. This technique is performed to stabilise the fracture and prevent further collapse. Fracture Fixation with Pedicle screws augmented with Cement - the fracture can also be fixed with pedicle screws and cement to ensure that the screws have a good purchase in the bone and do not loosen as a result of the osteoporosis. The most effective way to prevent vertebral compression fractures is to prevent osteoporosis. A well-balanced diet, regular exercise program, calcium and vitamin D supplements, smoking cessation, oestrogen hormone replacement for women and practicing good posture may help you to prevent osteoporosis.